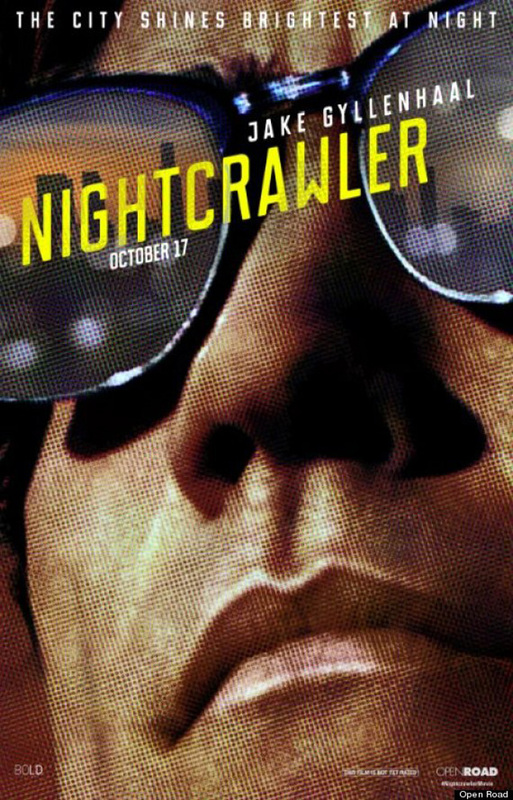 The surprise of Nightcrawler is that it works well on different levels: as a psychological descent with a deranged lead, as a media critique on sensationalism, and as a genre thriller. Jake Gyllenhaal (Prisoners) gives a truly transfixing performance as Leo Bloom, an ambitious sociopath who will stop at nothing to become the best at what he does. It so happens he films accident and crime footage to sell to the local news stations, and he’s not beyond getting his hands dirty if it means a better camera angle or a better payday. The actor reportedly lost 30 pounds and he appears otherworldly, his lanky frame and gaunt face making his bulging eyes pop. There’s a hypnotic intensity to his performance and a darkly comic irony that he speaks almost entirely in business buzzwords and jargon. The film chronicles his rise to power and how he uses his leverage to manipulate the people around him. The media satire is a little heavy-handed but still makes its points, especially in an age of scandal and hysteria. Rene Russo is also great as the desperate and bloodthirsty news producer who is charmed by Bloom but then gets too far in. Writer/director Dan Gilroy (brother of Tony) has crafted a haunting central figure that is morally repulsive yet entirely engaging, especially with a career-best performance from Gyllenhaal. He’s a fascinating psychological case, even if he remains relatively the same character from the start. He makes every moment an opportunity in suspense. Gilroy has a natural sense for visuals and especially how to pace his tension, drawing it out with precision in the final act as Bloom’s arrangements cause disaster. The nighttime Los Angeles setting and swirling tension remind me of Michael Mann’s Collateral. This is a movie that sticks with you long after thanks especially to the power of Gyllenhaal. This is a solidly engaging mystery with some twists and turns that don’t come out of left field. Russell Crowe is a journalist investigating the murder of a Congressional aide, who just happened to be having an affair with Ben Affleck, his old friend. There are strong performances all around by the cast, though Rachel McAdams seems superfluous as a blogger-turned-sidekick except for allowing the movie to barely touch upon the idea of print journalism dying. The biggest issue is the pacing. The movie stays at a constant simmer, which works for grabbing your interest but then the final plot blows feel lacking because the narrative has not risen in tension. In fact, I’d say the conclusion to one of the two main mysteries is downright disappointing the way it fails to dovetail with the other, larger mystery. There is a lot more that could be said over the state of modern newspapers and the inherent biases that need be kept at bay. State of Play is an intelligent thriller but ultimately too limited by the condensed framework of its script. This movie feels like it has more ideas to share, ethics to chew over, questions to tease out, characters to ripen, and that’s probably because State of Play is based upon a 2003 BBC miniseries that gave sufficient time for these elements to flourish. Still, I can’t knock this relevant, political, old-fashioned conspiracy thriller. It’s too rare these days that Hollywood churns out smart movies like this for adults.